This is my 300th post and my third blog. It is by far the most fun for me and hopefully, it's been a little fun for you, too. Thank you for putting up with my smart-snark, haiku hang ups, dinosaur lovin', pop culture commentary, book & movie reviewing, blog hopping, juvenile drawings, and...oh, heck, it's all pretty juvenile. If you can't have fun when you're an adult then what's the point? You might as well remain an ovum. In honor of the 300th post to CHERDO ON THE FLIPSIDE, I'm giving back to my community with some creative suggestions. 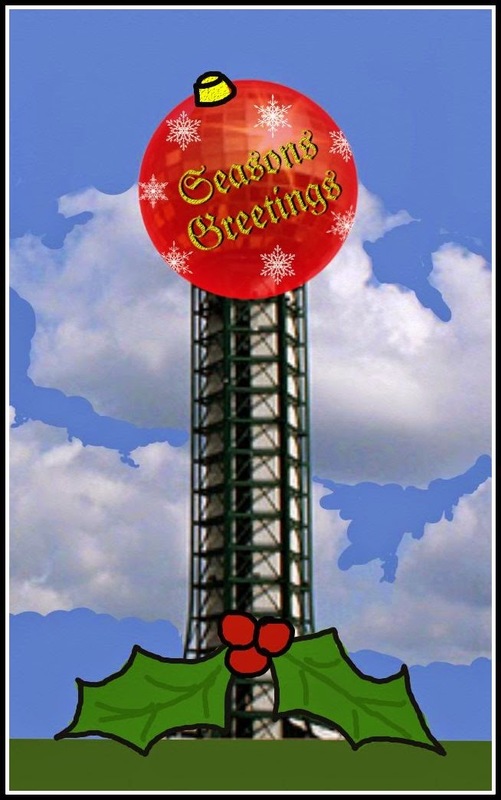 In Knoxville, we have an iconic remnant of the 1982 World's Fair in the form of the Sunsphere. Personally, I think it's cool and it definitely adds something to the city-scape that gives it a unique look, much like the St. Louis arch or the Golden Gate Bridge (with less magnitude). Every time Hubzam and I drive pass downtown, I spew forth positive comments on our own dear Sunsphere. Without fail, he replies that the "gold ball" should be torn down. Blasphemy! He is just jaded by his time in K-ville and constant exposure to this fancy orb in the sky. Unfortunately, I think many Knoxvillians feel the same way. They've lost their love for the shiny ball, but it's not too late. We just have to work with it a little more. As a resident of K-town, I've seen people dress their dogs and cats for everything from Halloween to Easter. Why can't we do that with the Sunsphere? 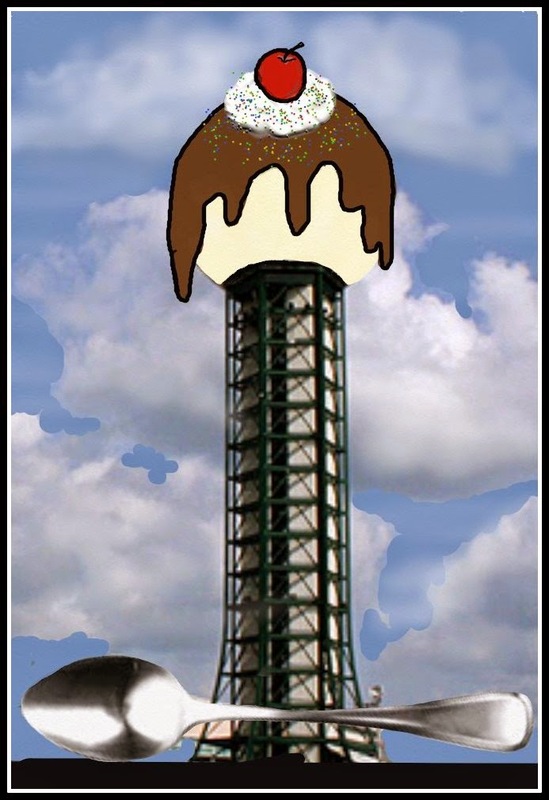 Disclaimer: No portion of the Sunsphere is edible. Going to Brewsters or Marble Slab is a tradition around here and dressing the Sunsphere as an ice cream Sun-dae has the potential to increase sales, thereby increasing tax revenue. The spoon is optional but you know that any mention of the spoon as a potential giant art piece will bring the University of Tennessee art students out in droves. Can you say "extra credit?" You'll have more spoons than you know what to do with in no time at all. Mayor Rogero, are you listening? These are gems. 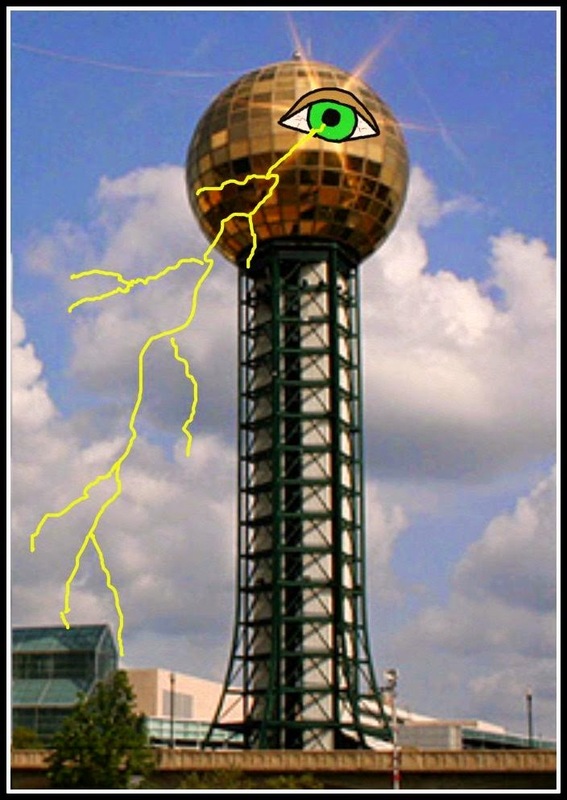 Disclaimer: Knoxville has no actual deadly rays coming from a big Sunsphere eye. Halloween ushers in hundreds of haunted houses, cemetery tours and Fall festivals. 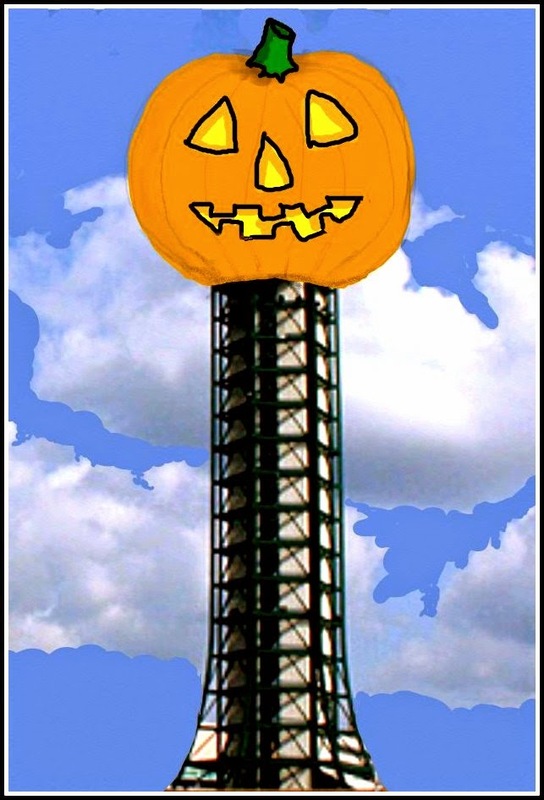 By decorating our Sunsphere with an Evil Eye, any passing tourist would realize we are serious about Halloween. Too scary? There's always the old standby, the Jack-o-Lantern. Disclaimer: The Jack-o-Lantern does not contain a giant candle. That would just be silly. 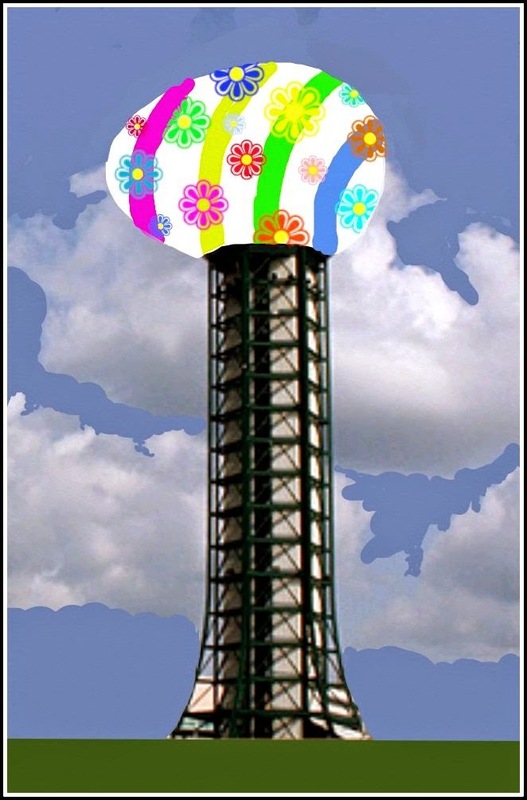 Having seen the new and improved Summer and Fall attire on the Sunsphere, the public will clamor for more. Disclaimer: Holly berries are poisonous. Not these, but in general. Happy holidays. Ho, ho, ho...Merry Christmas! Call the art students in once more for the holly leaves at the base. Disclaimer: No actual egg products were used. This is vegan display. Easter celebrants will appreciate the giant egg and if they're not celebrating the holiday, we can always go completely secular and, to quote Portlandia, "put a bird on it." Wouldn't that put you in the mood for Spring? Of course, it would. My son just walked by and suggested we turn it into a disco ball. He needs to up his creative game. Mayor, I await your call ( I'm available as creative consultant, should you need assistance). Thanks, Linda! (I deleted a duplicate post...I don't know why that happens sometimes, but I've experienced it, too!). Hokey-Smoke! Those drawings were pretty juvenile. No wonder I dug 'em. >>... In Knoxville, we have an iconic remnant of the 1982 World's Fair in the form of the Sunsphere. Good ol' 1982. I was drunk and happy that year. My genre is cartoons that look like any kid could draw them. The Sistine Chapel doesn't have any more wall space and the Smithsonian isn't looking for more art, so I figure I'm okay. Dead and Happy... HEY, THAT'S A THOUGHT. THANKS! I think a huge electrostatic generator would be in order. Put up a fence around it with keep out signs and wait for the daredevils to jump the fence and get vaporized. Youtube video viral nirvana. Eureka! That's a perfect idea! The second pic is brilliant - especially if Alan Parson's Project is blaring from loudspeakers! This is America: we can make that happen. Good suggestion, J! I see greatest potential in the big eye picture. Base of the Sunsphere could accommodate a Tesla coil with enough inductive voltage to send lightning bolts to any grounded conductor --like a human-- and could output amperage low enough to be survivable. People would flock to it just to get zapped and photoed with their hair standing on end. I see a whole new tourist industry in this, if not a new religion. Geo., I like the way you think. The tourism of the zapping eye would continue for years; it would make the World's Fair look like a lemonade stand. When that fad passes, we could let the police work with it and perfect it's aim. Connect it to 911, and give the police power to zap criminals downtown on the spot. Of course, there's that pesky "innocent until proven guilty" thing. Congratulations on publishing 300 posts on this your third blog! I take my hat off to you for being as prolific as you are terrific. In a world that gives us so much for frown about, The Flipside consistently gives us something to smile and laugh about. Thank you for doing what you're doing! 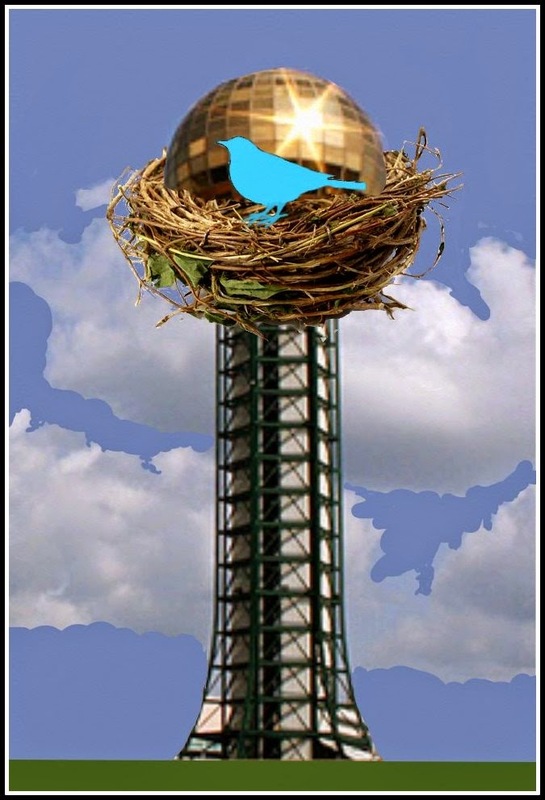 I think the Sunsphere is tasteful and enhances the look of the Knoxville cityscape. I read that it has observation decks, office space and a lounge. Your artistic concepts should be submitted to the K-ville redevelopment authority at once because they also have merit. Don't forget to include the disclaimers in your proposals. You need to cover your fanny in case a literal interpretation of one of your designs actually gets the green light. The more I look at it (along with your visionary renderings) the more I realize that your Sunsphere would be the ideal location for the corporate headquarters of my rapidly expanding chicken ranch franchise. We could call it Six Shags Over Knoxville and you would be commissioned to come up with the artwork. Once again I applaud you for cranking out 300 very entertaining posts here on The Flipside, dear friend Cherdo. Have a terrific Tuesday! Thank you for your kind words, dear Shagatha. You are a most faithful follower and I appreciate it more than you realize. "Six Shags Over Knoxville" - why don't I call you first before I post, ha ha ha. That is hilarious. We need to have Creative Skype...Crype. I'll just get everyone I know who is creative and funny together. We'll brainstorm themes like we're SNL on speed (which, if I understand it, is actually accurate) and polish 'em up. Two heads are better than one, so six or seven must be awe inspiring. Adulthood is so childlike. It's awesome. I think you have done a wonderful job with variations on the 'ball'. Making it more seasonal should make people look at it differently, for sure. It need to move on and not live in the past, right Linda? The Sunsphere is pretty enough as it is. But a festive seasonal decoration would be nice. No Dreamsickle colors, though. I agree, it's pretty; but Knoxvillians are not paying enough attention to it. They take it for granted. Good thought about the pastels. Ew. That's a shame It is a thing of beauty and is distinctive. What a wonderful idea and it's historical value makes it worth keeping. New Years Eve is the most obvious choice. I just realized I used their instead of they're...I'm an idiot. The all seeing eye was sure my favorite. Congrats on 300! That's my favorite eye-dea, too. Thanks, Pat! How about adding spider legs? We went up in the sunsphere when we were in Knoxville last year. It said "closed for renovations" but my husband wouldn't be deterred. We got in and he pushed the button and it dumped us out on a floor full of cubicles and people working. Someone was sitting by the elevator and gave us a kind of stunned look! They let us take a picture from the window and then we got out of there. Someone told me that observation deck was always "closed for renovations?" If that's the case, they need to just call it what it is and say the sunsphere is permanently closed to tourists. What gets me, though, is that people have actual offices in that thing!!! They kept doing things, opening things and shutting them down. It's like nothing works with the Sunsphere; but it's a local icon! 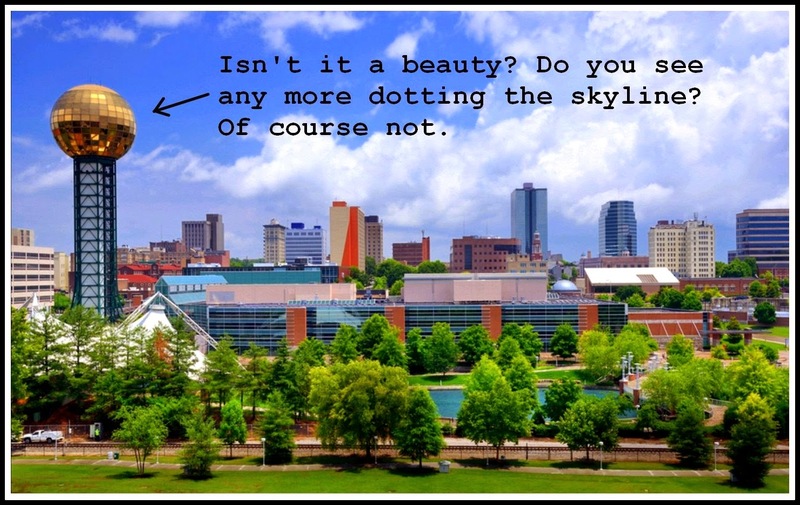 It defines the skyline of Knoxville. I'm with your husband: "I'm going in!" OK. The votes from the kids are in: two votes for the weird eyeball-y thing (kids said "Illuminati"?) and one vote for the bird's nest by Q (huge surprise). One of the other kids declared the eyeball and bird thing a tie and could have gone either way...(ha,ha). Haha! Those are great ideas! I think they should all be used. Congrats on 300 posts! I like your ideas. Why don't you run for mayor and do what you want? You have my complete support. I have $7.56 in my checking account. It is yours. Congrats on hanging around -- your blog, that is. Don't hang around me. You'll be swearing like a sailor. Will you run my campaign? I can come up with at least another $10 and mock up a poster. I can hang around you and not swear. I've done it for quite some time now, but I appreciate the warning. Are you feeling better, post birthday? I hope so. I feel so good that I'm going to take on your campaign! Boom. There it is. The phallic reference I expected to come from Shady Dell Knight; but no - it was innocent CWM. Sneaky devil.